Vaughan Merlyn started working on the concept of Business Relationship Management (BRM) in 1993. BP engaged Vaughan to develop a training program for their new BRM role with Profs. Michael Earl, London Business School, Chris Edwards, Cranfield University and Neo Boon Siong, Nanyang Business School, Singapore. I was introduced to the concept of the BRM role in 2009 while collaborating with Vaughan through our blogs. The time of the BRM idea, nurtured through the years, has come. Many companies are deploying the capability in recent years largely due to the effort of the BRM Institute co-founded by Vaughan, along with Aaron Barnes and Dr. Aleksandr Zhuk in 2013. The BRM Institute has created the BRM Body of Knowledge (BRMBOK) that has since been used as standard for BRM role certifications worldwide. I had the privilege to work with Vaughan, along with other BRM pioneers globally to publish the first version of the BRMBOK in 2014. I was working with a global building materials company at its operations in the Philippines when I started my career in 1997. We deployed a website in 2002 so that our customers can order Cement online. We faced major hurdles in convincing our customers to go online to order. One day, I drove with one of our sales representatives and accompanied him on sales visits. It was on one of our interactions with a customer in a small business location that one store owner asked: “Why can’t I just text my cement orders, why do I have to go online?”. This was the question that led to a simple mobile selling application that we built and deployed later that became more successful than the website. This solution eventually processed around 70% of customer orders. With this crude B2B solution, we also pushed payment reminders to customers and sent warm birthday greetings. As additional context to this successful deployment, during the early 2000s, SMS or Text Messaging became a phenomenon in the Philippines. Literally everyone was texting. The use of SMS technology became pervasive. Today, we are doing beyond SMS. Information technologies (IT) such as cloud computing, the Internet of Things (IoT), artificial intelligence (AI), mobile computing, data analytics, 3-D printing, virtual reality, and robotics are transforming industries, economies, and lives around the globe. The number of formerly successful companies being driven to obscurity by agile, tech-savvy competitors and substitute products grows daily. This exponential development of technology also made technology easier to use and more accessible. We have gone from an era where only a few people have access to information and technology, to one where it is virtually in everything we do. In business, this results in IT capabilities becoming more embedded into business capabilities. Organizations seeking competitive advantage need to learn how to harness that potential. Business leaders who want to compete in today’s market, and well into the future, have to lead their companies toward a true business and technology convergence. From my experience, the BRM role is one of the hardest roles to explain contextually. When I was interviewing for my current job four years ago, one of my interviewers, a senior vice president of the company told me later that he selected me from among candidates because I was the only one that explained the BRM role clearly to him. The most critical role of a BRM is to facilitate the convergence of business and IT. Because of this context, the BRM role performs responsibilities with the business organization and with the IT organization. The BRM diagram attached in this article is the most effective way I have been able to convey the clarity of the BRM role from my personal experience. I realized that the best way to explain it is to provide perspectives of the BRM role from the two converging sides. It is important to note that concepts in this diagram was derived from two of the earliest frameworks we worked on at the BRM Institute: BRM DNATM (Develop, Nurture, Advance) or the BRM Competency Model and the BRM Metaphors. 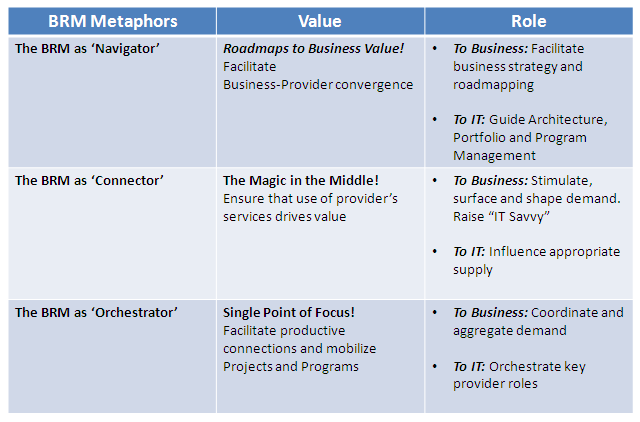 Facilitate Business-IT Convergence (BRM as Navigator) – BRM supports business leaders in the facilitation of business technology strategy and business capabilities road-mapping. In turn, these business / technology strategy and roadmap will guide Enterprise Architecture, Portfolio and Program Management. Drive Value from Provider Services (BRM as Connector) – BRMs as connectors are responsible for optimizing business value of IT. 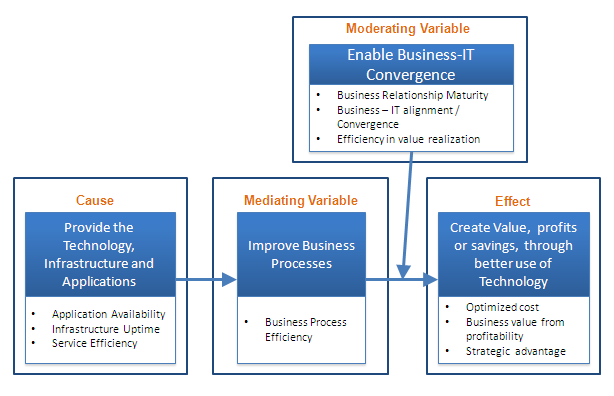 Value creation is about business performance and results from a dynamic balance between business demand and IT supply. BRM is not limited to IT Demand Management but rather Demand Shaping by raising IT Savvy of the business. Orchestrate Key Provider Role (BRM as Orchestrator) – With the business organization BRM is the single point of focus in mobilizing programs and business technology roadmaps. This is very different from the old paradigm of single point of contact. From the IT organization, BRM can also play key provider roles. For example, in my current organization, I also play the role of Business Process Management. This provider role may vary based on business need. I believe Business Relationship Management is the key lever of strategic speed for Information Technology organizations and the business. BRMs are “the oil to the machine” that reduces organizational friction. Fast is not always about pace. It is about people, shared perspectives, shared risk and rewards. If you want to know more about the BRM role, there is an upcoming opportunity for us to engage. I am excited that Vaughan Merlyn, BRMI Co-founder, and I are hosting the first of the #IamBRM series this Feb 22, 2018. This will be the first in a series of webinars leading up to BRMConnect 2018. We will talk about two core models, BRM DNA™ and House of BRM™, that underlie the Business Relationship Management role, discipline and capability. I collaborated with Vaughan Merlyn and the BRM Institute years ago when we started developing these models! Please register through this link to join us in this webinar sponsored by the BRM Institute. A couple of weeks ago, our office had a team building event at iFly. Most of us signed up to experience our first indoor skydiving and I did so with hesitation. At iFly, we had a short 30-minute instruction session and then, we put on safety gears. I made my dream of flight a reality! It was so amazing that I thought of bringing my 6-year old twin boys to experience it the following day. It was Friday so I went to pick up my sons from school. I told them we were going to iFly so they can experience indoor skydiving. They were not interested at all and both said no emphatically. I showed them how iFly does it through a video. They saw kids flying upward the wind tunnel. I said, “Isn’t this fun?” They looked somewhat convinced but a bit frightened. They responded no again with hesitation. At such a young age, my boys like to read and learn astronomy. They know their solar systems, galaxies and black holes. Very often, I hear them talk to each other about becoming an astronaut. They went to NASA summer camp together last year. I wanted to convince them to do iFly, so I told them that one other way astronauts train with weightlessness besides being under water is indoor skydiving. Their eyes lit up and we jumped into the car. They experienced iFly and went to tell friends about it with their hand upwards as if in flying motion. Why didn’t I communicate with WHY (to be an astronaut) from the very beginning? Instead, like most people, I started with WHAT (indoor skydiving) and the HOW (video). Simon Sinek’s TED talk How Great Leaders Inspire Action is about the idea that most people communicate by starting with the WHAT. By explaining his Golden Circle, Simon spoke about how transcendent leaders like Martin Luther King and innovative companies like Apple begin instead with WHY. At the BRMCONNECT Forum hosted by BRM Institute at the PepsiCo headquarters in Dallas, this was my story. I was asked by Aaron Barnes, CEO and Co-Founder of the institute to tell other BRMs the story of how I formed my team and what we do. I started my storytelling by sharing the Why. The vision and purpose of my team: To Be Strategic Leaders Driving Competitive Advantage. This is a shared vision with the rest of our IT organization. In the beginning, this seemed a lofty goal. To me personally, this Why is the reason why I get up in the morning fulfilled to go to work! We started with the Why but if we are going to be strategic partners with the business, our next challenge was the HOW. How are we going to put ourselves in the middle of business conversations and drive more strategic engagements? We turn to Business Process Management (BPM) as a means to foster business relationship. We created our Business Process Architecture (BPA) Framework and Process Assessment Methodology (PAM). We equip ourselves with an effective How. Now when business partners come to us with a seemingly tactical request to deploy a specific application system, we have the means to ask “what business problem are you trying to solve?” and “what strategy are you enabling?” And then the invitation, let’s partner and do a Process Assessment. With three phases of PAM– Align, Discovery and Solution, we end up proposing a business initiative or technology project or both. According to Simon Sinek every organization has a Why. “Your Why is your purpose, cause or belief that inspires you to do what you do. When you think, act and communicate starting with Why you can inspire others.” I realize there are effective use of this approach or concept in everyday — both in our personal lives and in business. Start with Why! Use of information technology. Is it creating value? Is it improving business processes and capabilities? Or merely creating new wants? Is it important, or only urgent? What is it for? Every Business and IT engagement around business requirements revolves around these questions but managing it isn’t always easy. First, let’s talk about IT organization’s critical role in the company’s business processes. One of the consequences of Business Process Management is a large majority of these programs are initiated in the IT organization. There are very good motives for this. One of the most common: the IT organization is responsible for providing the technology that enables business processes. Take for example, ERP (Enterprise Resource Planning) systems like SAP, Oracle, etc. This ERP solution is a suite of integrated applications that a company can use for many business processes. Most ERP systems incorporate best practices reflecting the vendor’s interpretation of the most effective way to perform each business process. Systems vary on how conveniently the customer can modify these practices. Talking about best practices, it is advisable not to over-customize because doing so will keep you from taking advantage of the expected improvements and innovations from the purchased ERP package. How do you characterize the nature of your engagement with your business partners? Is it functional orientated? If it is, there is more tendency for having more solution-based discussion versus process- and value-based. Even worse, it could be possible that your internal customer is engaging you at the tail end of their decision cycle–when they have already determined what they want or need. There is lack of business-IT alignment and strategic partnership. How do you then improve the level of your business relationship with the business? There are numerous paths towards that elusive business-IT strategic partnership. In this post, I will talk about Business Process Maturity as a path— so I would say – Let’s Talk Process First! This has worked for me in the past. One of the most effective ways to change the orientation and focus of business IT interactions is to start with business process. Calibrate your organization’s business process maturity and you will take along with it to a great degree IT-business relationship maturity. What you need are experienced business process managers with business relationship management competencies. Below I will walk you through these 3 stages of Business Process and Business Relationship maturity and describe what it means. When your organizational approach to business process is diverse, more often business-IT initiatives are managed with lack of integration. At this stage, most of the organization’s process knowledge is known only to a few individuals. For business process engagement facilitation, there is dependency on external consultancy. There is no standard process management discipline that leads to more functional orientation of IT requirements discussion. Consequently, IT as a provider organization is hardly seen as a strategic partner–at most, a service provider. 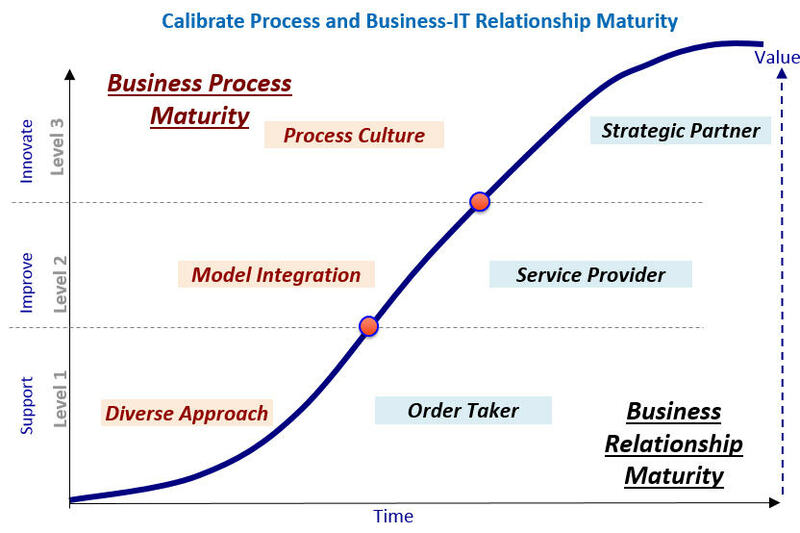 In terms of business relationship maturity level, most of the time, IT is treated as an order taker. This type of business relationship is characterized by loudest in – first out tendency causing reactive course of actions. My advice is to embark on a business process maturity journey. Establish a discipline of managing business processes as the means for improving business performance outcomes and operational agility. Leverage use of technology to improve business processes. You want to become an organization that designs processes first and then goes on to implement the technology enablers. Your organization wants to keep pace with technology and maintain a competitive advantage. Companies at this level adapt a consolidated method to design and implement business models using standard processes and tools. Process ownership ultimately improves as management breaks silos and approaches process and technology implementation equally. The common tendency is for companies to establish process governance and ownership. IT plays a key role in the process evolution of the company and starts to be seen as a service provider and some cases even a strategic partner. The final step to Process Culture Maturity occurs when innovation and change in business practices through process understanding are consistently promoted within the company. As executives passionately embrace process thinking, they are able to promote innovation more confidently when implementing new technologies. In many cases, companies with mature process culture has End-to-End orientation to process management and IT plays a key role as center of process excellence. IT starts to be regarded as trusted and strategic partner. Business–IT relationship is based on cooperation and mutual trust with shared goals to maximize value from business initiatives. Technology will not automatically implement itself and run your organization’s processes the way you envision. IT has a unique opportunity to spearhead business process improvements in the company. Start by changing the orientation of your business interactions from functional to business process, from solutions to value. Do not shy away from this opportunity. Use business process management to create greater strategic value and by doing so advance business-IT relationship level to new heights. Don’t tell me I did not warn you. The only thing I can promise is that you’ll learn a thing or two from this one, so please read on. I came across a predictive validity framework called the “Libby boxes”, popularized by Cornell Accounting Professor Robert Libby. This framework is used to examine the distinction between underlying constructs of strategic objectives and their proxy measures to illustrate causal models related to some objectives in an organization. Another definition of “strategy” is as a hypothesis about the cause and effect of your objectives. Predictive validity allows you to measure and analyze how well the execution of your objective (cause) predicts your desired performance (effect). Now, to illustrate the importance of a Business Relationship Management (BRM) function in an Information Technology (IT) organization, let’s start by picking a Business-IT strategy to dissect. Let’s call it “Strategy A”. Let’s start it simple and take an approach to illustrate cause and effect depict Strategy A using the model. We are going to be taking a very logical approach. The strategy here is— you believe that if you use technology better, you create business value. Let’s assume that technology is comprised of infrastructure and applications that enable the business or enterprise. Observe that Strategy A is too simple—or maybe exceedingly simple. Can we really say that if IT provides better technology, we create business value, in the form of profits or savings? Yes, no, maybe. How about this – it is because of better use of technology, we improve business processes of the company and therefore we create business value. In this predictive validity framework, the middle action is called, mediating variable. It stands between two variables and it is an effect of one variable and the cause to another. This brings us to iteration to our business-IT strategy. Let’s refer to this improved business-IT strategy as “Strategy B”. Strategy B: “Create value by improving business processes through better use of technology”. So how do you interpret this strategy? As an IT organization, your goal is to provide the business with the technology, infrastructure and applications to enable efficient business processes. This will result to business value creation through optimized cost, profitability and strategic advantage. Whew! Follow all that so far? I think this business-IT strategy works. If you run this, you have a good chance of successful outcomes. But your aim is not to be just good. Your aim is to be great. Your goal is to differentiate your IT department and to support your enterprise to be the best performing company in its industry or to be the best performing company (period!). So there is a missing component to your strategy, a moderating component—a component that will have a multiplying effect from certain causes and effects coming out from the collective work that you do. In this predictive validity framework, it is called the moderating variable. The moderating variable is a variable that determines how big an effect you get from a certain cause. 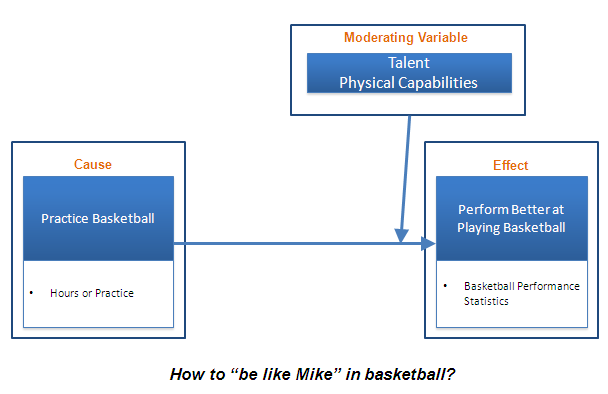 To illustrate, let’s say you want to improve your performance at playing basketball. By practicing basketball, doing drills and shooting, for sure it will improve your performance. This is a very simple causal model. You practice more and that, in effect, will improve your basketball performance. But think about this, is there a certain amount of practice that will allow you to be like Mike (Michael Jordan)? Most likely, no. Talent and perhaps physical capacities are the moderating variables here. Sure, practice will improve your performance, but if you have a lot of talent, a little bit of practice goes a long way and will make you much better. If you don’t have that much talent, you’ll have to practice a lot to get just a little better. Talent in this case is a moderating variable. Now that you understand what a moderating variable is, let’s go back to our Business-IT strategy. Think about an organizational capability equivalent to talent that can potentially transition your IT organization from good to great—it is business relationship management (BRM). BRM in this case is a moderating variable. The BRM capabilities moderate the effect of improvement of business processes and enablement of new business capabilities on performance, making it bigger (due to converged business-IT strategy) or smaller (in cases where it is lacking). Improved business processes and enablement of new business capabilities doesn’t cause BRM capabilities, it just moderates the effect. How? BRMs (1) facilitate Business-Provider convergence, (2) ensure that use of Technology that drives maximize value and (3) facilitate productive and connections and mobilize business-IT projects and programs. I joined the professional group Business Relationship Management Institute in April this year. My friend, Vaughan Merlyn, is one of the Institute’s founders. Vaughan and I share a common interest. We are both active in the blogosphere and we write about IT, processes and technology management. Last month, within the BRMI collaboration space, I shared the BRM Process and Competencies Framework which I created. I got a note from Vaughan today that he will use it in his upcoming BRM Professional training. The framework has been a hit since I posted it in the BRMI collaboration space. I received notes that private and public organizations are already using it in their workshops. I am delighted about this and I would like to share this framework with all the readers of this blog as well. The BRM competencies published by the BRM Institute inspired me to work on a framework that lays out the processes that are important to the operative function of the BRM role. The purpose of this framework is to identify the processes performed by the BRM role while matching them with the needed competencies. I started by identifying the processes that are performed by the BRM role in the organization. The process groups are: (1) Aligning (2) Consulting (3) Enabling (4) Servicing & (5) Evolving. Next, I identified the sub-processes or activities in BRM that are associated with the core processes identified. I must say, since my background and experience has been in Information Technology, this framework is defined based on this field. I thought that the Process and Competencies Framework was effective in laying out processes that are important to the operative function of the BRM role but did not clarify the overall context of the role from the perspective of the business. It only focuses on conveying the actions performed by the role and the needed competencies. So, I came up with the organizational pyramid. To have a context diagram showing the foundational relationship of the BRM processes all the way to the business strategy. I chose the pyramid structure to convey the interconnectedness of the foundation activities with the over-arching business objective. To highlight other support elements that help enable the BRM function. The previous framework mapped the processes with the competencies. I reckon that there are other support elements that are equally essential for the BRM in the performance of its role, such as: organization, knowledge base, methodologies, and tools/ systems. To show the hierarchical relationship from top (strategy) to bottom (processes). Before you perform the BRM role you start with strategic partnership, by aligning the role with the business strategy. The next level shows the structure of the partnership in a form of a business service partnership agreement and corresponding key performance indicators. 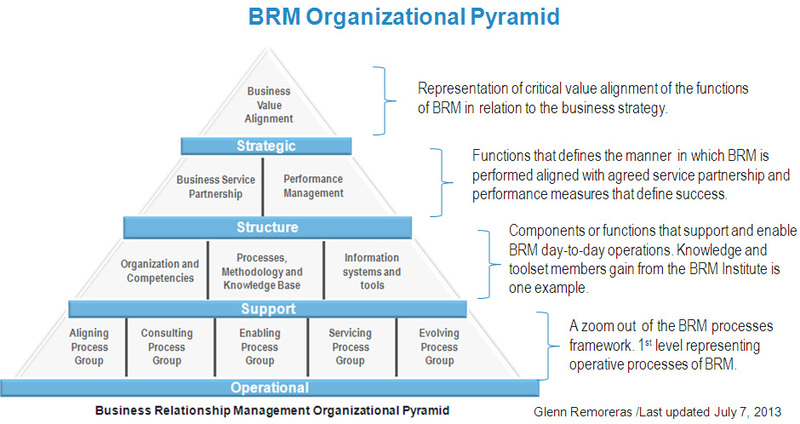 The aim of the pyramid is to clearly show the relationship of the five process groups to the Business Value Alignment (strategy), and then to the Business Service Partnership (structure) that defines the manner in which BRM is expected to be performed within set performance parameters. The support layer represents the enablers of the role– much of these are what the BRM Institute provide to its members. I hope you find both these frameworks useful in creating, developing and improving a BRM function in your organization. If you wish to access more materials and collaborate with other BRMs, the BRM Institute is the right professional group for you.